In our previous post about getting to know the SoilWarrior, we introduced you to its versatile row units and tough toolbars. 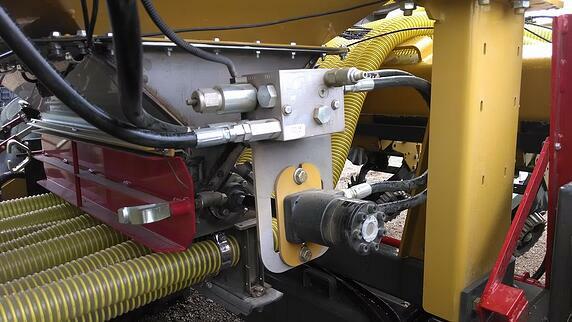 This article explores a few more features including cart assemblies and fertilizer systems. While each of these features are not necessarily unique in world of strip-till equipment, the fact that we build it as a complete system and deliver it to you hitch-pin ready is. So let’s examine at a few more features you will want to think about if you think a SoilWarrior is right for you. The machine gets its firm foundation from a construction-grade cart, which is available as standard or steerable. The standard comes in widths up to 20 feet and is great for producers who have fewer acres to cover. Steerable carts can handle toolbar widths up to 60 feet and come guidance ready. They are compatible with John Deere Active Implement Guidance and Trimble TrueTracker. Carts can either be tilting or non-tilting, with standard duty axels to match the row spacing. Depending on the size and type of tillage system, they are equipped with single or dual 420/90R30 R-1 or 540/65R30 R-1 radial tires. When it comes to nutrient application, getting close really doesn’t count. It’s like being fed with a slingshot. Once in a while some nutrients may get where they’re intended, but a whole lot more miss the mark. That does your crops no good, costs you money, and could be a source of nutrient runoff. With the SoilWarrior, you can be assured that your fertilizer is going to be placed right where it’s most useful—in the crop root zone. And its versatile design allows you to choose the delivery method that’s right for your farm. Our menu includes options for dry or liquid, anhydrous ammonia, and in the case of our HoneyWarrior, even hog or dairy manure. Growers applying liquid fertilizer can choose from 1,600 or 2,200 gallon capacity poly tanks. You can add twin elliptical 300 gallon poly tanks for extra capacity. For granular, the SoilWarrior can hold up to 9 tons in its twin, powder-coated steel tanks. Each row unit is integrated with hoses that provide single or dual nutrient delivery. 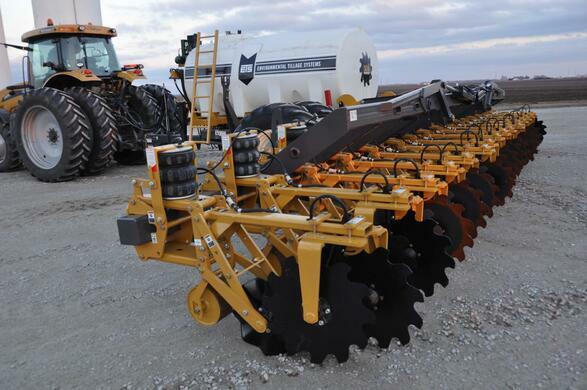 The N row unit also allows for placement of subsurface NH3 using a removable shank/knife. The action of the moving coulters blends the nutrients throughout the soil. This prevents the banding of fertilizer, which can lead to burning plants. Other features to note include a pulse width module that works seamlessly with industry standard VRT to precisely control your application rate. There is a built-in scale kit that helps you monitor fertilizer output. Run block monitor kits can also be installed to alert you if it stops coming out of a row unit. All of these ensure nutrients are incorporated into the zone at the right depth and right amount for your crops. Still not convinced? There is a 12-run meter system designed for 24-row machines that ensures uniform application. There is less than a one percent variance in application rates per row unit. Now that’s uniform. Next week we’ll dig deeper into VRT’s role in the SoilWarrior’s precision nutrient placement. In the meantime, if you’re ready to take the next step and talk with one of our sales managers about trying out a SoilWarrior on your farm, simply fill out this form. We’d love to talk with you about rental and financing options to get you in the zone this spring.